Directors – Hiroyuki Seshita & Kobun Shizuno, Screenplay – Gen Urobuchi, Producer – Takashi Yoshizawa, Music – Takayuki Hattori, Production Design – Naoya Tanaka. Production Company – Toho Animation/Polygon Pictures. Humanity has been forced to abandon Earth after it was overrun by Godzilla and other giant monsters. With the aid of the alien Exif, they have spent the last twenty years wandering the stars in search of another planet to inhabit without avail. Captain Haruo Sakai now stands up to challenge the mission’s purpose and is certain that their only hope lies in making a return to Earth. With the aid of one of the Exif, he has been secretly uploading schematics to the central computer that show how it is possible to defeat Godzilla. The crew is eventually persuaded of the sense of following this course and the ship is turned around. Arriving back on Earth, they find that 20,000 years has passed. However, Godzilla is still alive and as as the party land to assess the state of the world, they are promptly attacked. Godzilla: Planet of the Monsters was the thirtieth Japanese Godzilla film. That said, it is not a Godzilla film as you and your grandpappy knew it. This is the first ever animated Godzilla film. Certainly, we have had an animated Godzilla before with the Hanna-Barbera series The Godzilla Power Hour (1978-80) and Godzilla: The Series (1998-2000), a spinoff from the Roland Emmerich Godzilla (1998) but both of these were American-made. This is the first time we have had an animated Godzilla film and the first time Godzilla has appeared in the great Japanese tradition of anime. It is the first in a trilogy of projected Godzilla anime films and was followed by Godzilla: City on the Edge of Battle (2018) and Godzilla: The Planet Eater (2018). It also a very different Godzilla film than anything we have seen before. Most Godzilla films are not about too much more than Godzilla on the rampage and/or beating up one or more other giant monsters. There is none of that here. We see images of one or two monsters in the background montage of Earth’s devastation at the start but that is it, while Godzilla does not even appear until 55 minutes into the film. Instead, the majority of the film plays out as a Japanese space opera. This is a well-established tradition in anime – think of something like Space Cruiser Yamato (1977) – but leads to a very different look and approach for a kaiju film. All of the Godzilla films have nominal science-fiction elements – usually no more than the alien invaders or super-science devices created to defeat the monster – and these are dwelt on in no more depth than is required than to set up the monster bash or provide a means to defeat the monster(s). The surprise here is that we leap into full space opera and planetary adventure. As in the case in most science-fiction anime, a good deal has been expended on designing the vehicles, mecha, drop ships and computer consoles in the control room. It is doubtful, for instance, that any other live-action Godzilla film can boast having a specialty prop designer. You appreciate Godzilla: Planet of the Monsters for the fact that it is trying to do something different – creating a story on an epic canvas 20,000 years into the future and incarnating Godzilla as an avatar of pure destruction that threatens the entire planet. On the other hand, while you prepare to sit down to watch a Godzilla film, the big disappointment come in that keeps Godzilla off screen for the bulk of the show and the story is instead focused on the slow and slightly melancholic story of humanity adrift in the universe – think of something like Battlestar Galactia (2003-9) minus the Cylons. Things do pick up in the second half and we get some mass destruction sequences towards the end with humanity battling Godzilla. 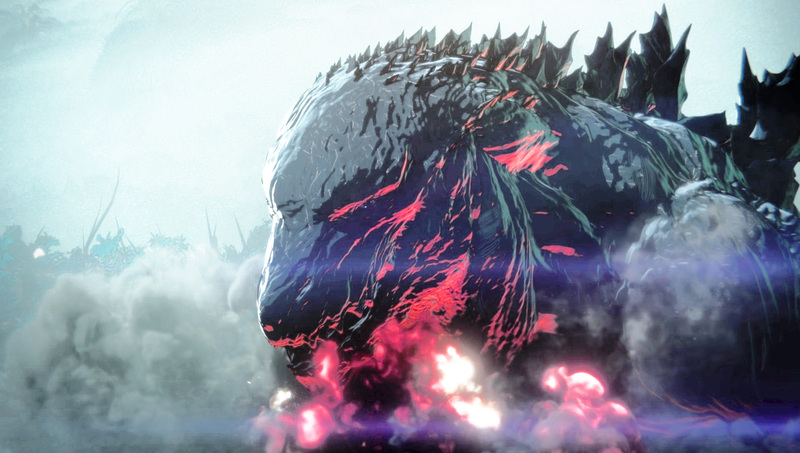 However, rendered in animation and compared to the awe-inspiring visual effects in recent Godzilla outings such as Godzilla (2014) and Shin Godzilla (2016), these pale into forgettability. Not to mention the film reaches a frustratingly abrupt and unresolved ending, no doubt keeping things open for a sequel.